Having four girls I guess it comes as no surprise that we've played with a lot of dolls n this house over the years, my daughters have always loved role play and enjoy playing mums and dads, doctors and nurses and of course these sorts of games are always made better with the toys that they can involve. 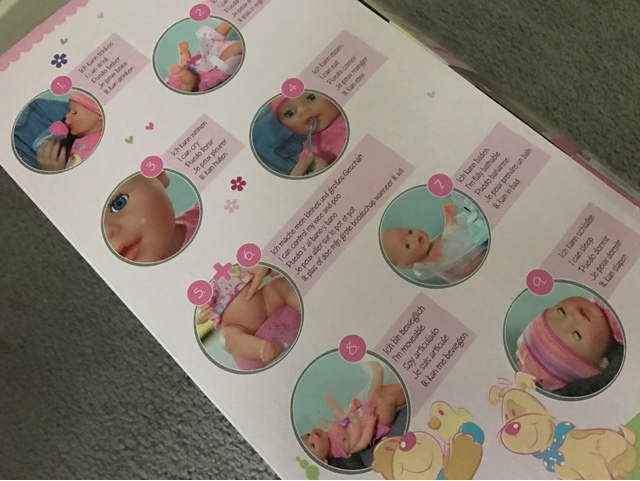 We were recently sent the Baby Born Interactive doll and it has been most popular with my 4 and 7 year olds. 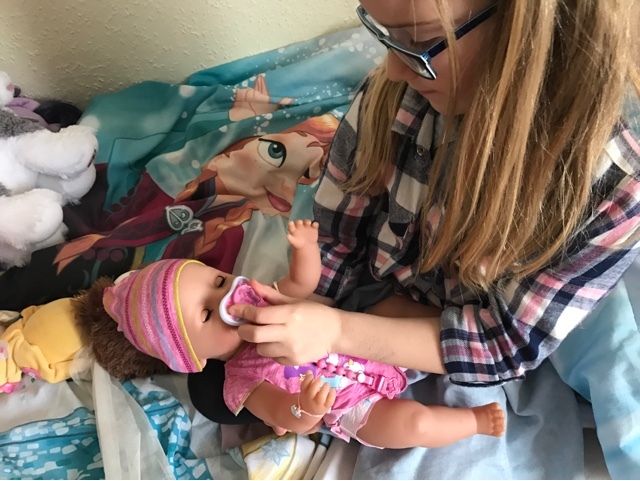 The new Baby Born doll now has 9 functions to keep pretend play interesting and with no batteries required it is a toy that has a lot of appeal to both children and their parents. 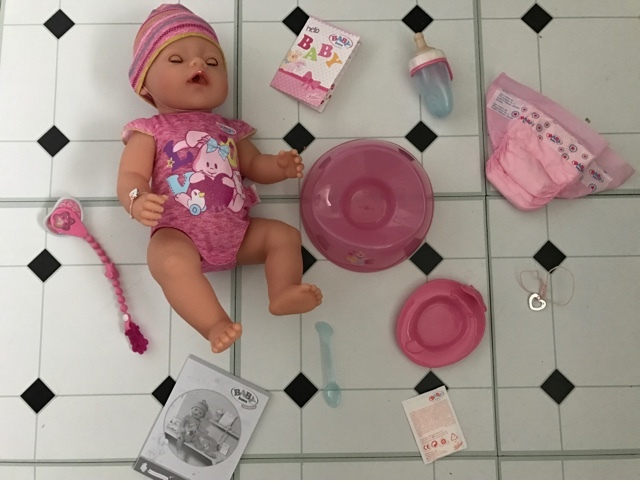 The doll, which my kids named Jessica comes complete with 11 accessories which includes a cloth, spoon, plate, bottle, nappy, potty, magic dummy, a birth certificate for you to sign and really cute bracelets. Now I bet you're wondering just what the functions are that I mentioned, this clever toy can wet and poop on the potty (clever baby), it can drink from the bottle provided and you can feed it too. 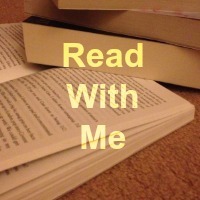 This has been a favourite feature here. 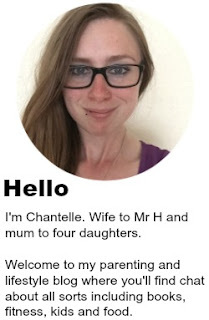 Pressing on the belly button makes the baby go to toilet, my lot have had a lot of fun changing nappies, although they're not half as bad as the nappies I used to have to change. 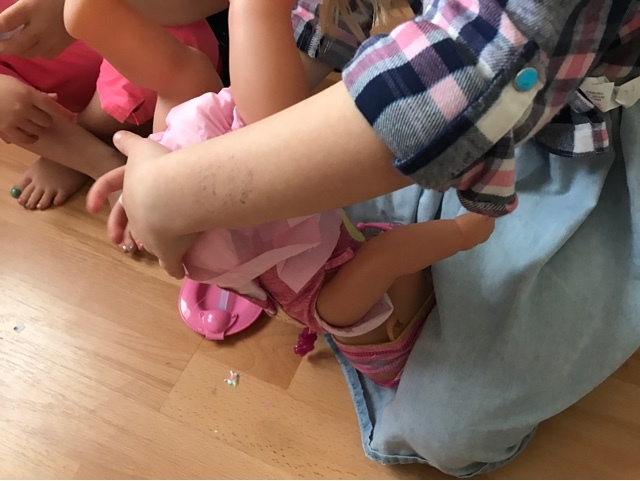 At 43cm tall, this dolls arms and legs are fully moveable making it easy to position the baby either in a pushchair or on the potty provided and to my children's excitement, Baby Born can even be put in the bath, this has made convincing the youngest two to get into the bath in the evenings a far easier task than it used to be. 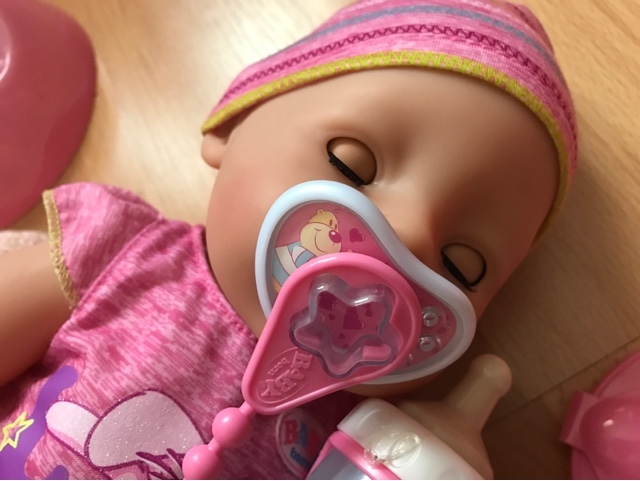 Another feature is that the eyes can open and close, this means it is simpler for a child to pretend if the baby is asleep or awake, from previous experience with babies that would have to be less nap time and more play time. 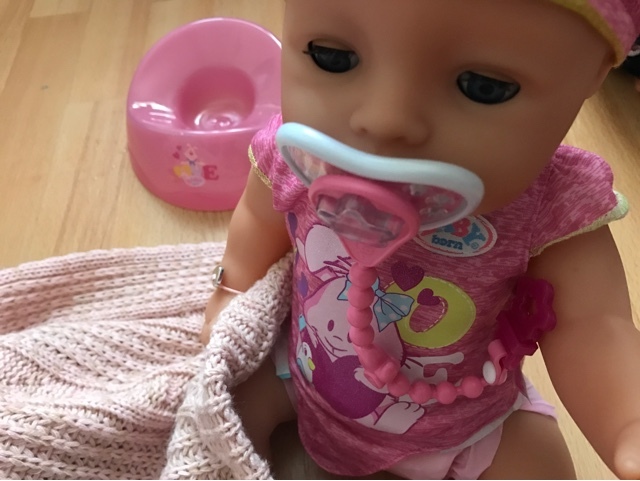 I've loved watching my lot engrossed in game play, cuddling the baby, putting her dummy in to stop her from crying, I'd say got babysitters in the making right there. 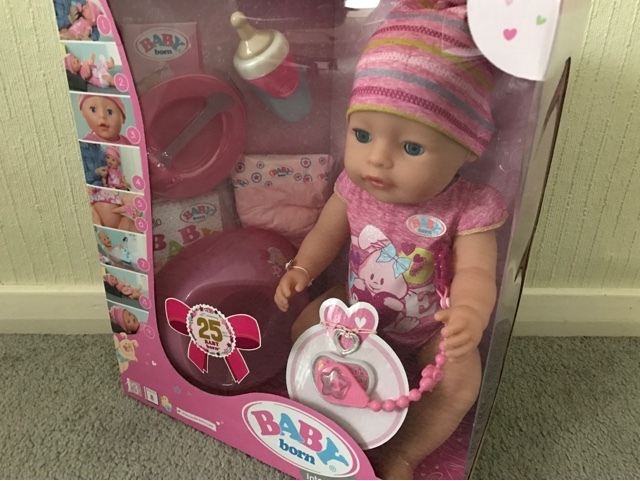 Baby Born is a classic doll and with these added functions and the accessories that are included, this is a toy that will keep many kids entertained for hours at a time. 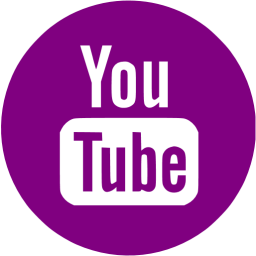 The only part which I found to be less desirable was the food, it wasn't the easiest to mix up and it only comes with enough to do it one time so you would need to buy more if you wanted to do the same again. 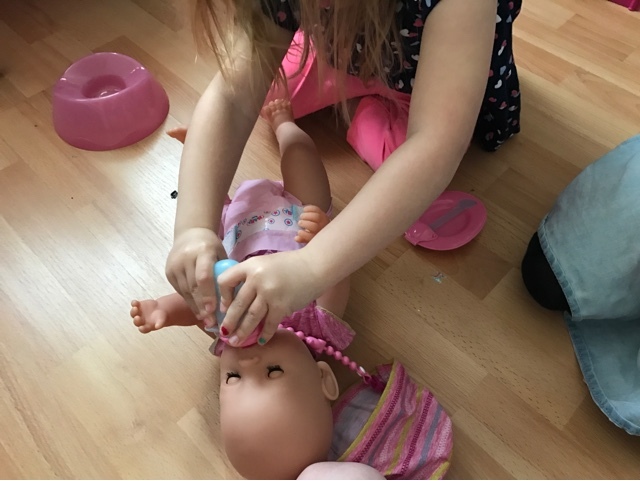 I loved playing with babies when I was younger and it is so nice that I get to see my children doing the same, my mum has still got my dolls and my first pram and I'd like to be able do the same for my girls. 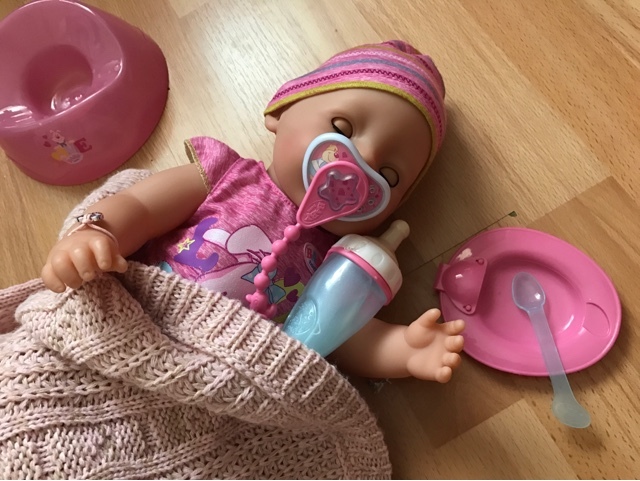 There is a boy version of this doll but I don't think it matters what the gender is because we all know that both boys and girls alike can play with babies regardless of whether they wear blue or pink clothes. 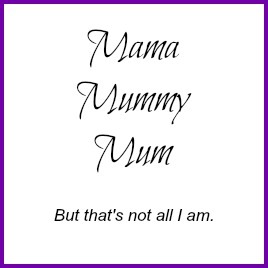 Do you still have your toys from when you was a child?